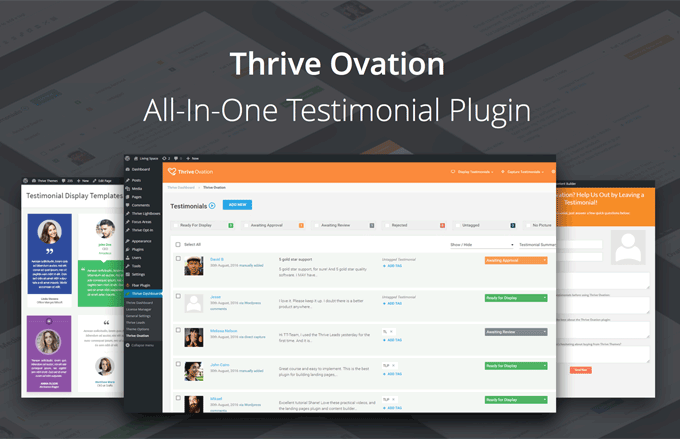 The latest, brand new product from Thrive Themes is a testimonial plugin for WordPress, Thrive Ovation. 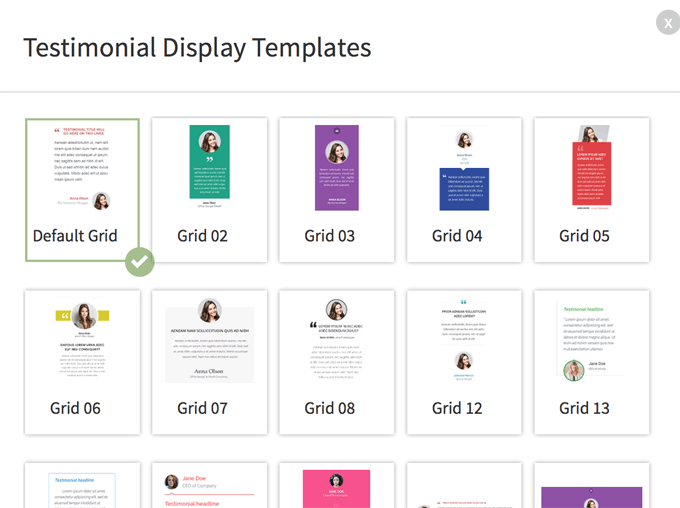 It allows you to collect testimonials from your audience wisely, and currently with 37 templates, it lets you create stylish and versatile display. Very easy to use. Video instructions, by the co-founder Shane Melaugh viewable within the dashboard, are straightforward and easy to understand. So here we go today, in this Thrive Ovation review I hope you'll get the feel of the plugin. Getting a testimonial on your webpage is a two-step process, right? (1) You ask someone to write it for you then (2) you publish it on your page. You need a nice template to display the testimonials. There are a few decent WordPress plugins available for that for free. However those plugins are designed to do (2) but not (1) - you still have to collect testimonials manually, by email or copy & paste from elsewhere such as social media. Thrive Ovation has its back-office that automates the process between the two. It will collect testimonials, manage them and automatically put them on display. All you have to do is to approve them, or edit the content if you wish to. You can operate Thrive Ovation either in conjunction with Thrive Content Builder or by using WordPress short codes. 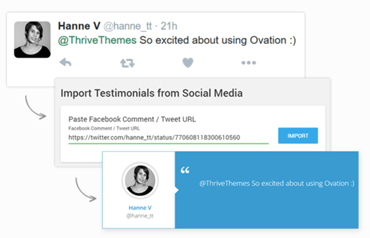 You can also collect testimonials using Thrive Leads - place an "opt-in form" anywhere in your site. Just swap the opt-in box with a testimonial capture box, i.e. request form, which I'll show you later on in this page. ​Download a zip file (2.3Mb in size) from your Thrive account page and install it on WordPress as normal. 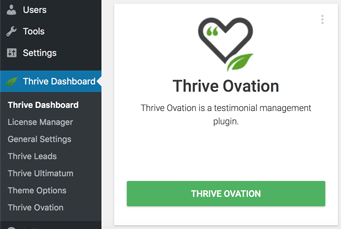 You'll find Ovation in the Thrive Dashboard in your WordPress menu. Okay so there are several ways to collect and manage testimonials before publishing on your website. 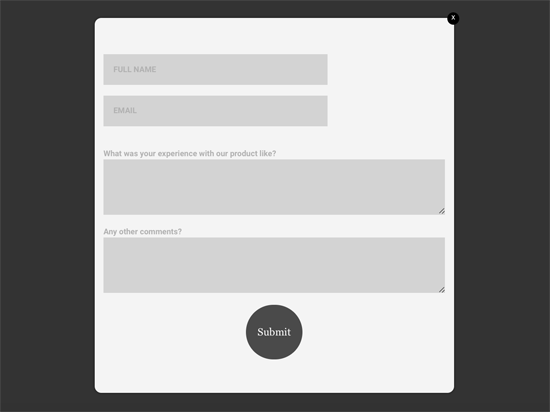 A request form ("Capture Testimonials") can be placed anywhere in your web page. "Contact Us" page, or at the end of an article - anywhere. 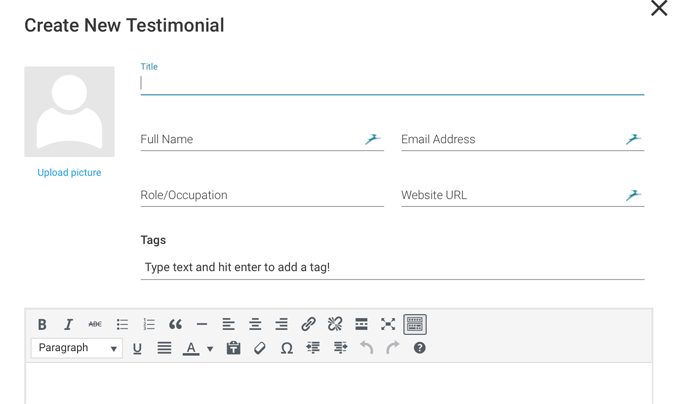 Or you can create a dedicated "testimonial submission page", give the url to your customers/visitors and ask them to fill it in. So anyone can fill in the form, and you as the site owner have an authority to approve, edit or reject. When approved it will automatically be published. Just like a website comment function, right? Three capture templates (styles) are available. I'm just showing you all the three templates side by side above, but the form can be as large as full-screen size. Plus you can add extra boxes such as the contributor's (a) Title (b) Role/Occupation (c) website URL. The main box can be one freeform box, or as many boxes as you like, with a specific question heading such as "How do you think we can improve our services?" "Any other comments?" The contributor's photo is Gravatar-enabled via the email address, or can be uploaded manually. If you also have a Thrive Leads licence - you can use it to create a testimonial capture. Thrive Leads is a list building plugin - fancy popup "Subscribe To Our Newsletter!" kind of opt-in form. What you can do is to make it to "Tell Others What You Think!" - by removing the opt-in box area and inserting the Ovation's capture form instead. ...You most likely to edit the content, then click save. It will be published in your desired testimonial page automatically. The video instruction by Shane is available within the dashboard, and it's really easy actually. It will turn a social media post into a testimonial in your website within seconds. And of course the traditional way - someone sends you a testimonial by email. Or your great-grandma's wartime sweetheart sends you a handwritten letter (what!? a testimonial?) 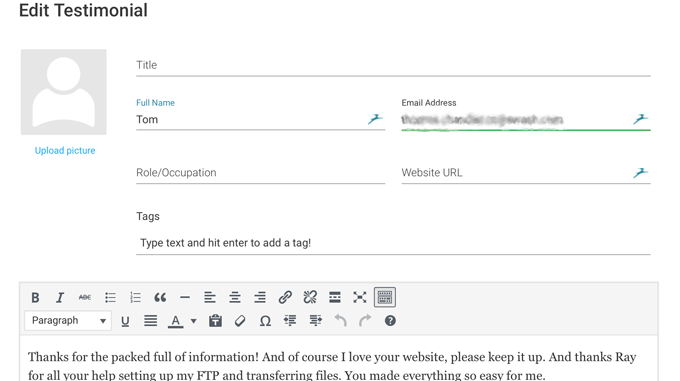 You either copy and paste it or type it in within the Ovation dashboard​ in WordPress. Once you approve a testimonial, it becomes ready for display. You can build testimonials statically or dynamically. Meaning with Static setting you manually add contents as normal. Every time you receive a new testimonial, you go to the display box and click to add. But the great feature that Thrive Ovation offers is the Dynamic setting. New testimonials are automatically added to the display page as you "approve" in the dashboard. This is where you use the awesome "tagging" function. You may provide three different testimonial submission forms in your site, and name a tag of each one"ProductA" "ServiceB" "General". In this way as soon as you approve a testimonial, it will be automatically allocated and displayed in the appropriate testimonial page. Or you may have one submission form for all three testimonial pages. Each time you approve a testimonial, the Ovation will ask you which one to tag​, i.e. which testimonial page you want it to be displayed. Whether you are a Thrive Content Builder user or not doesn't make a difference. The process is exactly the same except the very last second. If you choose the "shortcode" option, the code will appear as soon as you save your template, like the image above - you just click the button to copy the shortcode and insert it anywhere in the WordPress editor. While with the Content Builder you drag it from the side bar menu to the main screen. That's all it is. 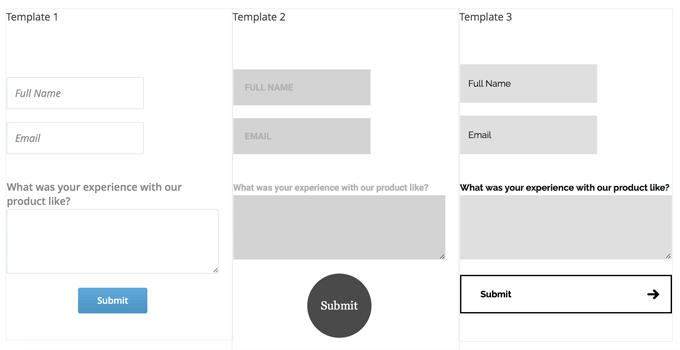 You do that when you display the submission form and also when you display the testimonial boxes. Thrive Ovation Review - Is It Worth The Money? You may have worked it out by now. Thrive Ovation is perfect for those who have, or plan to have testimonials added on a regular basis. Otherwise this plugin is not essential. Having said that (and considering I don't have many testimonials in my own sites! ), I personally find this plugin very exciting. I think Shane and his Thrive team have done a great job once again.